If you have any questions or want to enquire about dates, use our form to contact Fiona McAdam or see their website for more information. Sitting at the mouth of the River Aln, the village was an important trading port in Northumberland’s past; now it is bustling in summer, fairly hushed in winter. 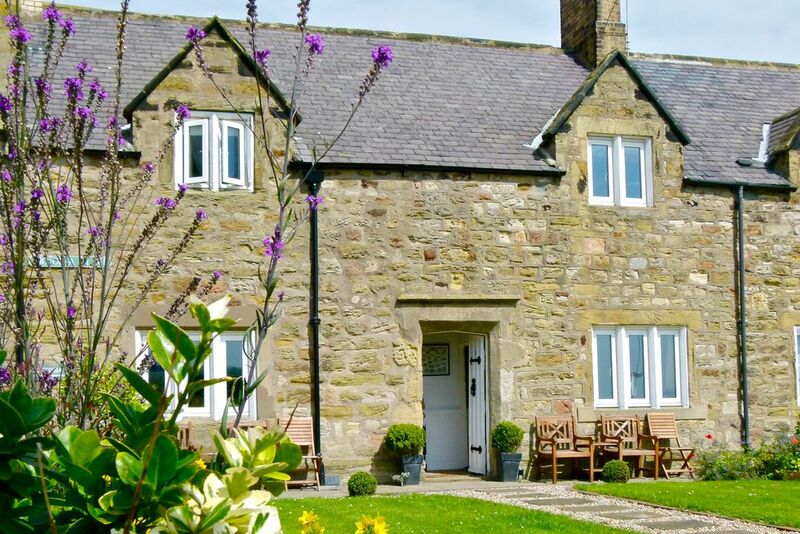 At right angles to the road, are a row of 17th-century sandstone cottages with sweet gardens and views of the sea. Both Victoria and Smuggler’s have good sized sitting rooms with open fires (logs are on the house), Farrow & Ball paints, New England style shutters, comfy sofas and original art inspired by the ocean; smart kitchens have Amtico style floors and enough gadgets for the fussiest of cooks. Both cottages have a double and a twin upstairs: crisp white sheets, goose down duvets and pillows; bathrooms (Smuggler’s is downstairs) are sparkling and modern with baskets of soaps and lotions. On fine days it will be lovely to sit by your own front door in the plant-filled gardens and listen to the waves, or just cross the road for the glorious long, sandy beach – even a swim if you’re feeling brave! The village has good pubs and an Italian if you don’t feel like cooking; the local golf course has stunning views, castles are near. Lovely. Discount if both cottages taken together. 1 small dog - £30 per week. A beautiful cottage overlooking the beach. Beautifully appointed too, with everything we needed or wanted for a relaxing stay. The fire was an extra luxury, the cottage clean, welcoming and user-friendly. The location - in the village but very quiet with such wonderful views - would beard to beat. The owners were easy to communicate with and very friendly and helpful. Would definitely return here. Pleased to see these cottages on this site. I have stayed a few times and have found them to be extremely well kept. The duvets are the snuggliest ever ! Alnmouth is a great place and the view from the cottages is great. We have taken over both cottages for family celebrations and we have had great fun. Booked to stay again next month. Pop to the quaint market town of Alnwick . Visit Alnwick Castle [for Harry Potter fans] or wander round the enchanting Alnwick Garden with its Grand Cascade, Poison Garden and water sculptures, then take a bite in Europe's largest tree-house restaurant. Dare the tides and cross the white sands to the Holy Island of Lindisfarne. This serene setting was the birthplace of the Lindisfarne Gospels and home to St Oswald.